All transactions are safe and secure with a reliable history in online purchasing behind each of our associates. 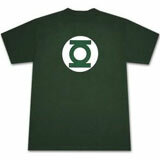 Buy the Green Lantern Logo t-shirt to own Green Lantern clothing and merchandise. If you want to be a member of the Corps, then this logo Green Lantern costume tee will help get you there. Don't restrict your options to Hal, you could be the original character Alan Scott, created during the Golden Age by Martin Nodell and Bill Finger. There are also alien heroes you could choose to be like Brik, Aa or Tuebeen. To switch sides and be a villain, check out the Sinestro shirt in the gallery. In addition to the Green Lantern Logo tee above, browse the Green Lantern Clothing Gallery for more apparel like men's and women's clothes, kids shirts or hoodies.